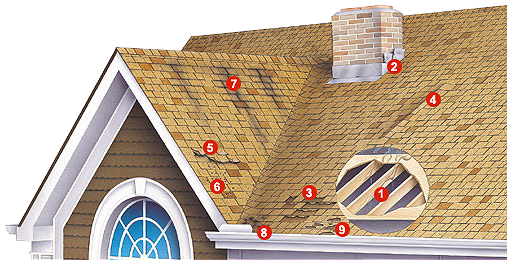 There are several stages to your roof's life and at some point it will be past the point of repair and need replacement. One of the hardest things about replacing or repairing a worn-out roof is finding a roofer you can trust. Drawdy Roofing & Vinyl Siding's over 40 years serving South Georgia is from doing what is in our customers best interest which has been one of our company policies since the beginning. Below we show several warning signs that a roof may experience due to the aging process. Contact our service department if you feel you need a repair or would like an estimate for a replacement roof. There is never a charge for an estimate though fees may apply if for a service call Remember, neglecting a problem may lead to additional repairs as rotten wood, ruined sheetrock and insulation so do not wait. For roof estimates If your damage is due to hail/storm damage, you can find information here.